In the Fall of this year Delineavit et Sculpsit will celebrate its thirtiest birthday. Started in 1989 at the Leiden University printroom, only two of the four editors of the first hour are still in office, Albert Elen and Thera Folmer-von Oven. Janno van Tatenhove passed away in 2010 and Jaap Bolten stepped down in 2013. Charles Dumas and Robert Jan te Rijdt joined Delineavit et Sculpsit slightly later in 1991 and have now been serving for 28 years. We are all growing older, some nearing retirement or already enjoying it. This certainly has advantages for our periodical because, as devoted art historians, and our profession also being our main hobby, we do not really retire, only from our jobs. Relieved from our official obligations we continue at least part of the decades-long daily routine of research, writing articles and editing those of others. This is how Charles Dumas has been able to devote a lot of free time and energy to the final editing of several issues of our periodical during the last five years, some including substantial articles by himself. Anyhow, having reached or passed the age of seventy he and Thera Folmer-von Oven have expressed the wish to step down in 2019-20, after the publication of issues 45 and 46 for which they serve as main editors. Robert Jan te Rijdt has also decided to step down this year. For the position of chairman we will undoubtedly find a good candidate. For that of secretary, which has remained vacant since the demise of Erik Löffler in 2016, we invited Jan de Klerk to join us. Two other early career professionals have also joined the editorial board to replace Robert Jan and Yvonne Bleyerveld: Marleen Ram and Joyce Zelen. Jan served as a registrar in the Museum Boijmans Van Beuningen (2018) and has just started in a new position at the Amsterdam City Archives. Marleen is a researcher at the Rijksmuseum printroom, specialized in drawings. Prints specialist Joyce Zelen, finishing her Ph.D. thesis in 2019, is the first Jacoba Lugt-Klever Fellow at the Fondation Custodia and the RKD. Joyce, Jan and Marleen are the new generation which will gradually take over from the old, a wonderful prospect for all of us! 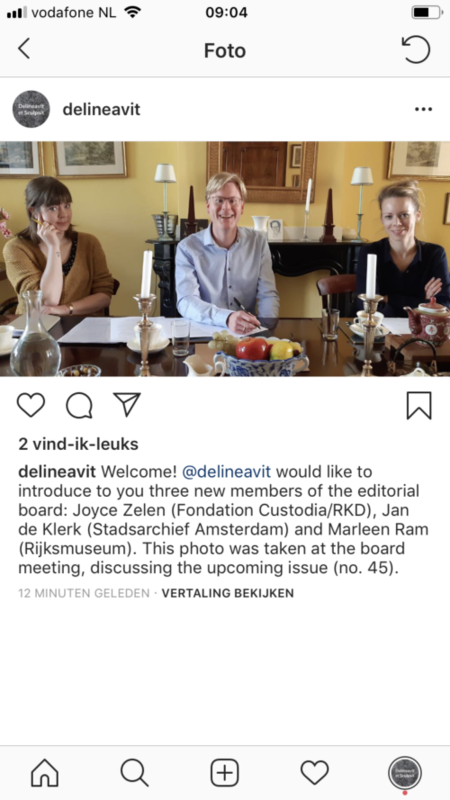 You can also follow developments at Delineavit et Sculpsit on our Instagram account @delineavit, managed by Marleen Ram.